In the festival of Holi, the joy doubles when you celebrate it with your family and loved ones. 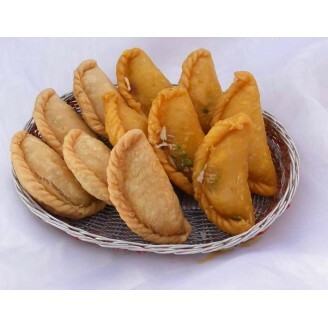 It's the time to sprinkle colors on them and enjoy the scrumptious recipes like Kesar Gujiya. Send special Holi wishes to yours family & friends with this lovely gift hamper. This kesar Gujia includes kaju, nuts, elaichi dana (cardamom), mawa (Khoya) and appealing fragrance of Kesar (saffron) dipped in the syrup of sugar. Sweets from kanha/LMB if delivery in Jaipur for other cities sweets will be from local branded shops.